That’s right! 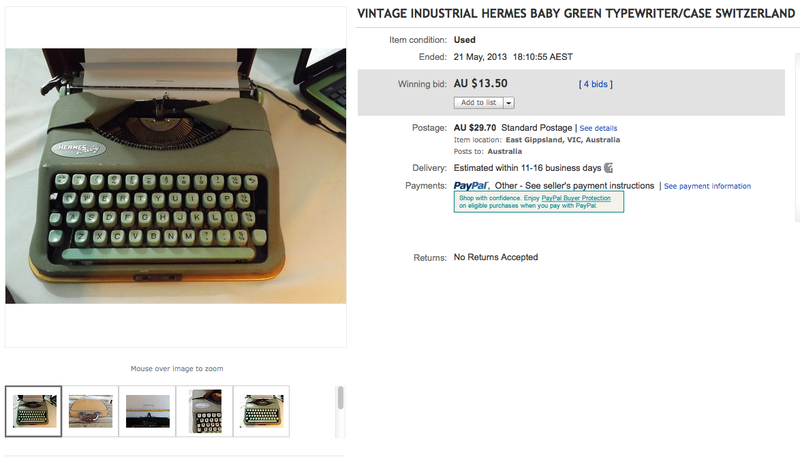 A Hermes Baby – 50’s design, sold for $222.50 on Australian ebay. Now I’ll admit that this machine looks to be in great condition – bar a few chips of paint. 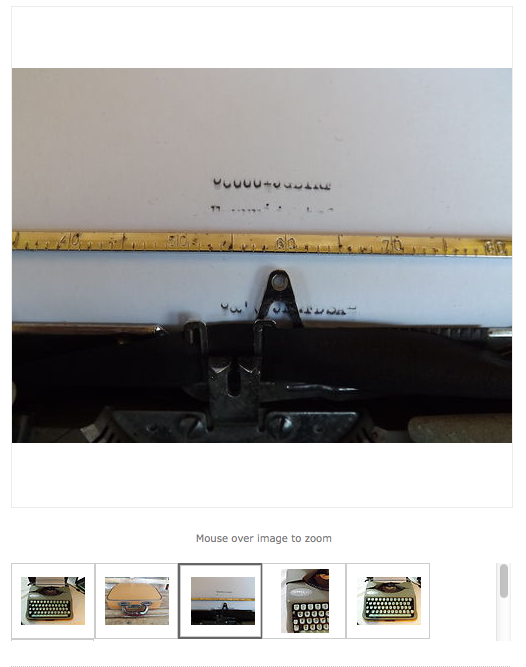 The seller even stresses that it ‘works’. However, if your biggest advertising point is that it has ‘the original re-seller label’, chances are your machine isn’t really all that special. This to me is a bit worrying, as this isn’t the first of these machines I have seen hit the $220 mark. And not just here, but in the USA as well. Honestly, people should really do their research. If you’re going to actually use it for writing, it isn’t your best option. And as far as decoration is concerned, the colour may be nice – but don’t kid yourself that you might actually use it. Just buy a busted one. 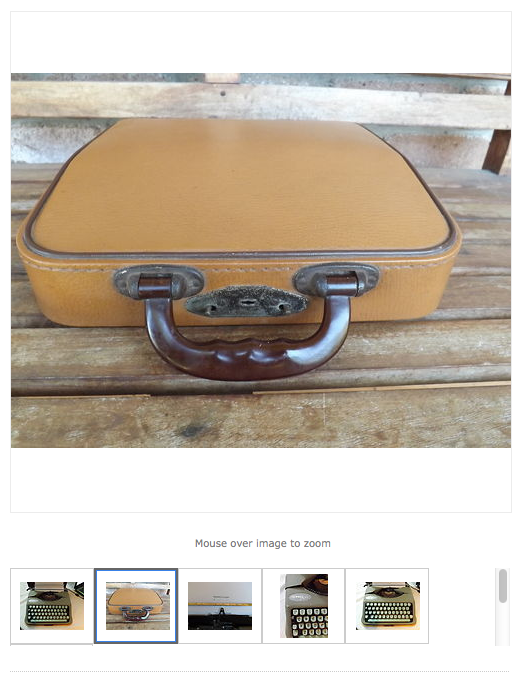 So with 9 bids made by 5 different people, all of which I suspect don’t really know that much about typewriters, you’d think that a Hermes baby with the ‘De Luxe’ case would have had them “losing their sh*t” when it came on sale two days before the other auction finished. However, this is how it ended up. That’s right, less than half the cost of the postage. It wasn’t typing lower-case correctly. This problem with limited to the lower case only. Also, one of the ribbon covers weren’t sitting correctly. As it turns out, I already had a Hermes baby – 50’s style (with original re-seller label) that is called ‘Kermit’, which had been endowed with a green ribbon. I’m also sure that it is of no surprise to anyone that the $13.50 bid on the Hermes ‘De Luxe’ was my bid. And 5 days later, I received from all the way down in Victoria; yet another Hermes baby. Kermit is indeed in better condition than the machine that sold for $222.50, but shhhhhh. Don’t tell anyone. And especially don’t tell the seller of the De Luxe machine, how quickly I fixed the typewriter. It’s a sunny Brisbane morning late in May, and I was sitting down to breakfast. I laid out my knife and fork, started brewing a pot of my favorite tea, I fired up the stove and flicked some bacon in, and then noticed that next to my dining table chair was an unopened box. I had brought the box up stairs the night before, but I was so exhausted from work that I just left it there. I grabbed the box knife from my desk, and slashed it open. I pulled out the beautiful pleather case (I’m certain it’s pleather, not real leather) and I brushed off the rice bubbles before placing it on the table. I returned to the kitchen, turned over the bacon, threw in a few mushrooms and tomatoes, and then came back to the typewriter. Sure enough, the carriage seemed a bit wonked. I grabbed the can of spray lube from my desk, and sprayed it into the hinge of the carriage lift. I then worked it back and forth a few times. I pushed my thumb against the side of the ribbon cover, and bent a tiny lip of metal back. I pushed the ribbon cover down, and viola! It stayed. I shoved a piece of paper into the machine, and with the carriage now oiled, the letters lined up perfectly and the lower-case letters could be read. I dished out the bacon onto a plate along with the tomatoes and mushrooms, then ate a very nice breakfast. Yep. I fixed a typewriter while cooking breakfast. In the battle of the sexes, I think I just achieved ‘doing more than one thing at once’ status for the boy’s side. 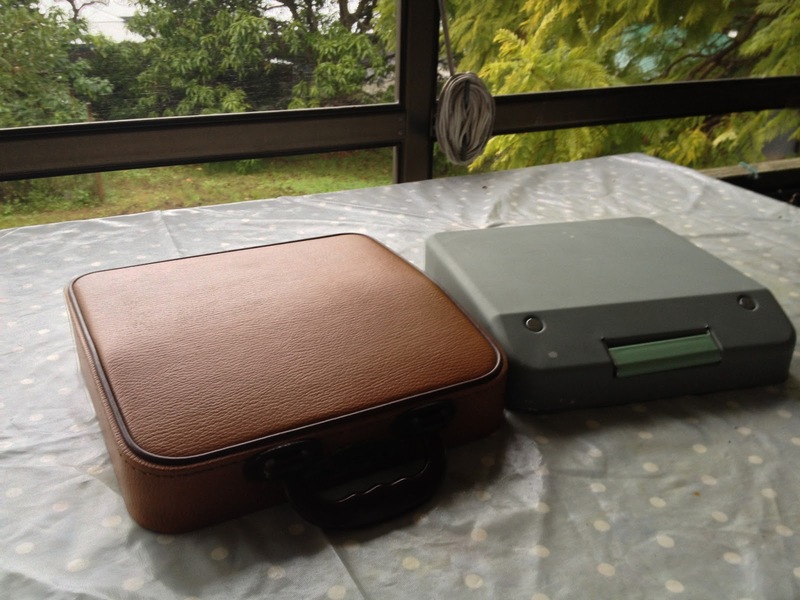 Not to mention… I can brag that I fixed a typewriter in the time it takes to cook breakfast. Incidentally, it turned out that I didn’t even need to use the spray lube. It was just a bit of muck in the mechanism that could have been just as easily blasted out with an air-compressor, rather than worked out with a bit of lube and some wrangling. So I scrubbed the machine with Ryan Adney’s crinkle paint cleanup method, and apart from a few chips in the paint (life scars – I love them, because it shows the machine has a wonderful history) it was looking beautiful! Not to mention, writing just as nicely as Kermit. Look at that gorgeous copper trim! The pleather! The fabric inside! The sumptuous green! I’m sorry, I just… really like this machine. Anyway, I’ve hit the wall. I can’t justify having so many Hermes babies / Empire aristocrats. So it is time for Kermit to go. Of these era, I have two Empires, and a Baby with a Cyrillic keyboard. Not to mention I also have 3 of the next model baby as well. Now, before I get requests from all and sundry asking for Kermit – He’s already been claimed. Baroness, who had been babying him previously, would really like it and has offered to buy it off me. So I’m doing a special price for her – which is nothing near the ‘silly hipster’ price. 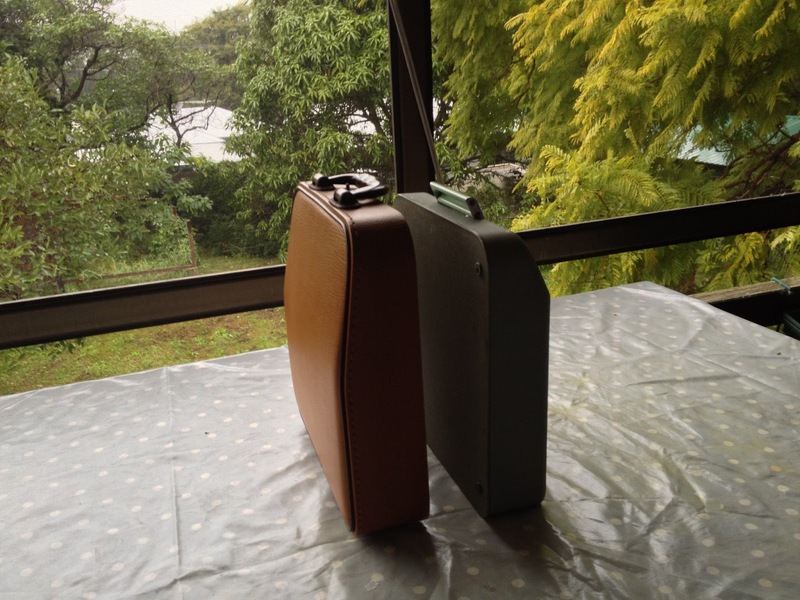 I’ll do a post on the De Luxe cased Hermeses a bit later – as I have another little surprise to add. But I thought I would just share with you my experience, before any one else makes the same silly mistake of paying that kind of money for a Hermes Baby. No seriously, stop it people. I feel embarrassed for you. Just add the ‘p’ to leather in your head, would you? ← Post #100. The end of the Royal saga. Wow, I have never seen a deluxe Baby case before. That repair was so quick it must almost have been disappointing. very nice! I love it when the fix works. I have a Hermes Rocket (http://typewriterdatabase.com/1956-hermes-rocket.1190.typewriter) that I use on our RV trips. I wonder what the difference is compared to the Baby. Looking at your photos they appear identical. 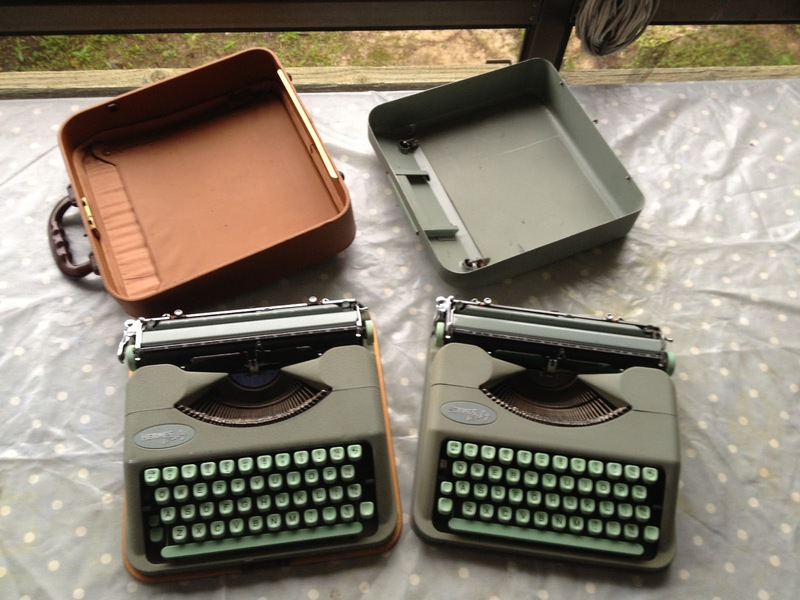 Recently I compared the Rocket with two other candidates for travel typing; an Olympia SF that arrived in excellent shape here in Northern California all the way from Germany, and a Lettera 32. All three produce nice crisp type and have no issues. But the relatively solid feel and sound of the Rocket compared to the other two, as well as its compactness, have kept it on the RV packing list. I first saw one on Adowa's blog last year. I've since only seen one other outside of this one. So I think they're pretty thin on the ground. Fixing them in the thrift store too? Hmmm…. I might have to try that! I love it… and… well, sort of hate it. As Richard said, almost disappointing. The fix was so quick and so easy, that I was say to have not even had to bring out my tools. No challenge! Mmmmm alright, I might have been a bit harsh on this actually quite competent typewriter. But, I stand by my statement that there are better writing machines. They're good, but not great. But they certainly type better than, say, a Cole Steel or a Rooy. After all, I have so many of these machines – I can't say that I think they are terrible. Well, I have to – otherwise there will be no writing over lunch!